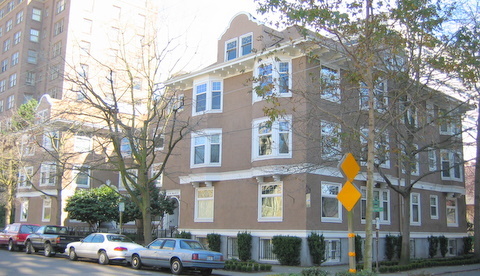 In the 1880s-90s, First Hill, with views and proximity to downtown, developed as the premier residential neighborhood, with the city's finest mansions. However, by the early 20th Century, apartment buildings began appearing, and the San Marco, built in 1905, was one of the first. It was designed by the prominent firm of Saunders and Lawton for Bert Farrar, a local developer, and proved to be a good investment and a very popular living option for those who could afford it but did not want to buy their own house. The building’s scale and massing fit well into the mansions that surrounded it at the time of construction, and its Mission style, unusual among local apartments, reflects the nearby Summit School (now Northwest school), designed by James Stephen in 1904-05. George W. Lawton (1863-1928), born in Wisconsin, came to Seattle about the time of the Great Fire in 1889. He worked as a draftsman for the prominent firm of Saunders & Houghton before entering into partnership with Charles Saunders in 1898. The firm designed a wide range of projects, including the Lincoln Apartment Hotel, several commercial blocks and warehouse and mill buildings as well as numerous residences. They adeptly used a wide range of revival styles, including Romanesque, Classical, Tudor and Colonial. One of their most noted works was the Forestry Building (1908-09) at the Alaska-Yukon-Pacific Exposition, a classical design executed in raw logs. 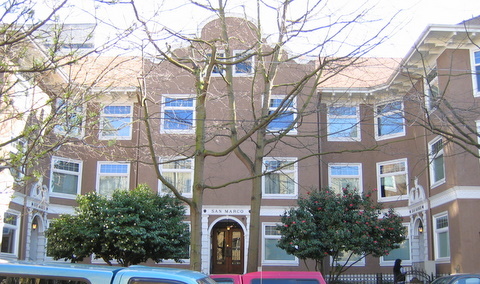 Few of these early buildings remain, other than Horace Mann and Beacon Hill (now El Centro de la Raza) elementary schools. The partnership dissolved in 1915. As an independent practitioner, Lawton worked with A. W. Gould on the Arctic Building (1913-17), famed for its terra cotta walrus heads. From 1922 until his death in 1928, Lawton was in a partnership with Herman A. Moldenhour (1864-1976), specializing in large office and apartment buildings, including the Fourth & Pike Building (1927). The San Marco is a wood frame structure clad with stucco, with three stories above a daylight basement. It is U-shaped in plan, with an irregular shallow entry courtyard facing north on Spring Street. The central side gabled section has a projecting pavilion and two symmetrical wings, each with hipped roofs with bracketed eaves. Centered in both the front and side elevations of the wing roofs are gabled dormers with curvilinear parapets, which are repeated on the projecting pavilion. The stucco exterior and the shaped dormers and parapets exemplify the Mission style as it was practiced locally at this time. A stringcourse with a carved diamond pattern separates the upper stories from the first. At the second and third stories of both wings there is a pair of two-story angular bays on the front and side elevations. Within the courtyard, three arched entrances lead into the central section and each of the two wings, containing a total of nineteen units. Most of the windows, originally double-hung with curved muntins forming a diamond pattern in the upper sash, have been replaced.